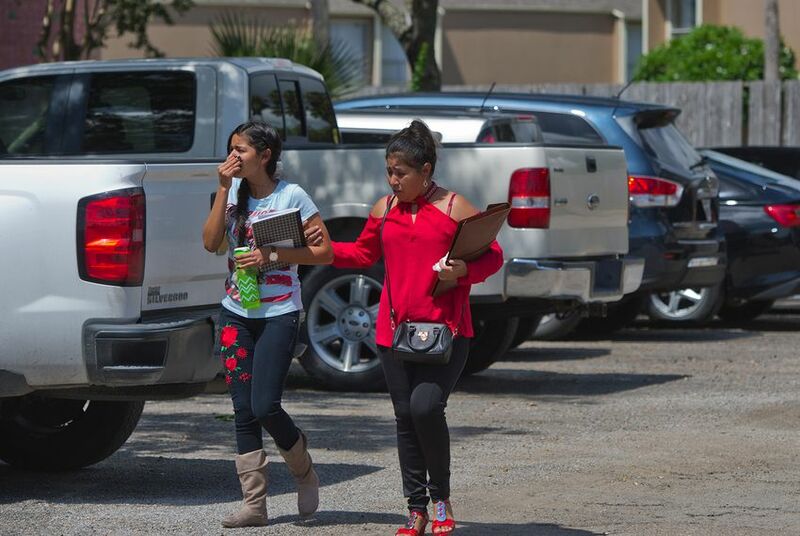 After fleeing El Salvador to protect her daughter — only to get separated from her for almost two months under the Trump administration’s "zero tolerance" policy — Mercedes was finally reunited with 16-year-old Maria at Bokenkamp Children’s Shelter in Corpus Christi Friday. Tears dissolved into smiles when the two walked out of the shelter together — 56 days after U.S. authorities separated them in South Texas. Mercedes, 38, had been released from an Austin-area detention center for women on June 20 after convincing the U.S. government she had “credible fear” of torture and persecution back home and then posting a $1,500 bond, said her Austin-based lawyer, Lindsay Gray. Mercedes spoke with The Texas Tribune on her way to pick up her daughter in Corpus Christi. The Tribune is using their first names only at Gray’s request. "I said, 'I want my daughter,' and they said she is very close," Mercedes said. Ultimately, though, she and Maria rode out their separation hundreds of miles apart. Mercedes said she and her husband decided to flee El Salvador on April 25 after they were targeted by criminals in Atiquizaya, located in a rural area near Guatemala. She said her daughter had been sexually assaulted in 2016, and since then they had faced extortion and threats. Mercedes said the MS-13 and Barrio 18 gangs are fighting for territory in her neighborhoods, but she was unable to say if the calls she received came from one or both of the gangs. That’s when they decided to get out. Her husband said, "We are going to have to leave. The girl’s life is in danger," Mercedes told the Tribune. "We took a bus and went toward the border [with Guatemala],” she said. Her husband, who also crossed the border, has since been deported. Mercedes pleaded guilty to illegal entry in federal court on May 21. Before seeking asylum in the United States, Mercedes said they sought help from Guatemalan authorities — to no avail. Gray said their complaint to the police could help the family win an asylum case at a time when U.S. authorities are narrowing the circumstances under which migrants qualify for asylum. Under new guidelines issued this week, asylum seekers claiming they are fleeing domestic or gang violence generally would be ineligible, for example. “In so many cases, the individuals being persecuted are afraid to contact the police, and they just don’t because they know they’re not going to get any help, and in this case they were so desperate that they did contact the police and the police affirmatively didn’t do anything,” Gray said. Reporter Jay Root contributed to this story.